Alana’s offers a traveling art show. Periodically some of Alana’s art disappears and then comes back after a short journey – kind of like an errant garden gnome. 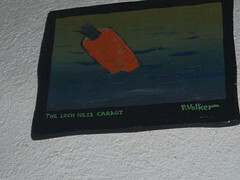 The Loch Ness Carrot has disappeared three times. After each abduction it was returned via US mail, wrapped in cheesecloth with a note included about the travels and travails of the painting. A different work of art was appropriated by an inebriated patron. It was returned the next day and hidden behind a shrub. The culprit left a very long, repentant phone message explaining the circumstances and details of the crime to Alana. 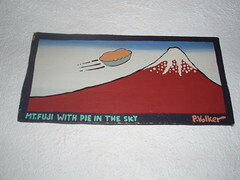 These purloined paintings are the work of local artist Paul Volker. If you have ever pilfered from a restaurant – post a comment. This entry was posted on April 22, 2007 at 6:49 PM	and is filed under restaurants, Vegetarian Friendly. You can follow any responses to this entry through the RSS 2.0 feed. You can leave a response, or trackback from your own site.